CouchWarriors to Host the Video Game Room at CHAOz Con! CouchWarriors is pleased to announce it has teamed up with the upcoming convention event, CHAOz at Melbourne University on August 23-24! CHAOz is a convention for the Cosplayers, Hobbyists and Artists of Australia (Oz). Among the many events will be community run panels, workshops, along with card games, screenings, and video games! We’ll be there alongside the team from New Game Plus, with a full suite of fantastic fighting games to play, with a range of added con gaming favourites and some cool surprises. We’ll be sharing our full schedule of events for the con soon. Expect to be able to join in Learn To Play training sessions for your favourite fighters, prove yourself a con champion in Tournaments, try out new and old games in a range of genres, or just chill and play casually. Meanwhile, make sure you follow CHAOz on Facebook, also Register for the Event, and we look forward to seeing you there! 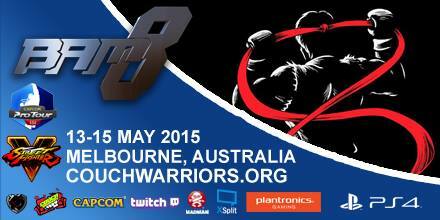 Tournaments, casual games, tips and training – CouchWarriors Ranking Battles are a day long fighters festival! Join us in the Mason’s hall for some honorable combat the knights templar will be proud of and grab some tasty Sydney Rd pizza while you’re at it. A good time was had by all last Sunday the 13th, at the July CouchWarriors Ranbat. Primarily a Smash event with players keen to practice ahead of this weekend’s ACL Sydney event which features Smash for the first time in many years, the Smashers turned out in force. Two friendly tournaments and plenty of casual matches were also played for other games. Now with 8 setups for all your playing needs and plenty of space for you to bring your own system and play whatever you want. Make sure to BYO sticks though guys! (Or beg / bribe people there) Even during events there will always be casual setups also free for use. Rank battles that will be stacked according to skill. Move up in the ladder and improve along side people around your level. Monthly resets means if you improve you will move up to a new tier! These will run from 7:30pm sharp. Every week will be a new game with a chance at salt and glory! We wont announce what it is until right before the event starts after signups! This will run after the SF4 league. I bet one will be Karnov’s Revenge. SF2 Anniversary Edtion? CE-Bipson best Bipson. A ‘main stage’ will be set up with a webcam overlooking it all that will be constantly streaming. Melbourne Fight Night Fridays Live! Link to the Facebook event page with further details and be found HERE. COUCHWARRIORS RANKING BATTLE EVENT: July 13th EVO Weekend! Tournaments, casual games, tips and training – CouchWarriors Ranking Battles are a day long fighters festival! It will be EVO Sunday and the stream will be on projector at the event. Plus, it’s practice time for the Smash players heading to Sydney’s ACL Pro event the following week. That’s alongside tournaments for a range of other games. Come play or BYO your setup. Enjoy some casuals or get in your tournament practice for the next major, Shadowloo Showdown.